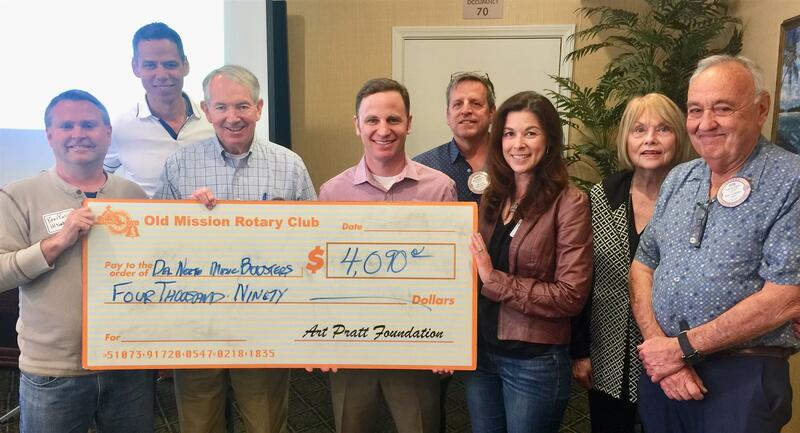 On April 3, the Art Pratt Foundation of Old Mission Rotary presented a grant to the Del Norte High School Music Program. The program is made up of more than 200 students and a booster association. The funds will be used to install lighting for their traveling semi-trailer truck that is used to transport equipment to shows and competitions. Photo: (L-R) Ben Russ of the Del Norte High School Music Boosters, Gary John Collins, Bob Self, Lee Kaminetz and Mark McAnelly of the Art Pratt Foundation, Lori Martin of the Del Norte High School Music Boosters, Judy Copeland and Bob Chalfa of the Art Pratt Foundation.